This is the ideal treatment for anyone looking for a more youthful appearance. 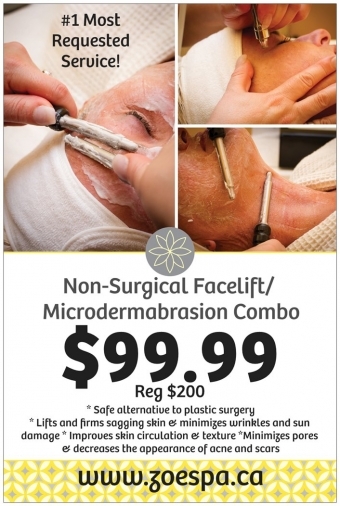 Includes both a non-surgical facelift and a diamond microdermabrasion. Stimulates cell production to smooth and soften lines & wrinkles. Gently wears away the roughness of the skin's outermost layer, while cleaning out your pores! This treatment is 60 minutes long. Your Zoe Spa non-surgical microderm will help your skin look and feel more youthful. Now until the end of January 2016.